Fresh, live Christmas trees are available for purchase at Jubilee Zoo beginning the day after Thanksgiving each year. See our calendar link for open days/times. We generally carry Fraser Fir and White Pine trees in a variety of sizes. We offer flocking and/or local delivery at an additional charge. For pre-purchased trees, please comment on your order form when you plan to pick up or have your tree delivered. Don't just buy a tree - make memories each Christmas at the Christmas Jubilee! 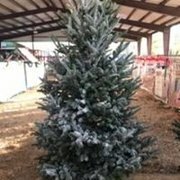 $10 for delivery of any tree up to 10' tall purchased from Jubilee Zoo to your home or business within 15 miles of Jubilee Zoo - 6402 Highway 1, Shreveport, LA 71107. For distances over 15 miles please figure $1 per mile. Delivery is available to addresses up to 40 miles from Jubilee Zoo. You will be charged $10 when you order tree delivery. After we receive your order we will MapQuest the mileage to your address and bill your credit card for any extra mileage fees. Tree will be delivered to your front door by our driver. If you are available to meet him and have a clear path, our dirver may be able to bring your tree inside for you. (Tips for good service gladly accepted). Please allow up to 3 days for delivery. You may request certain days/times and we will do our best to accommodate. Let us know your delivery preferences in person or via email jubileezoo@jubileezoo.com. 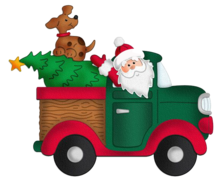 Delivery may be arranged online - tree sight-unseen - or you may come pick out your tree for delivery in person and enjoy an experience the whole family will remember! 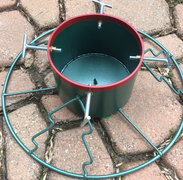 Metal Christmas Tree stand for trees 5 to 11 feet tall. This sturdy stand will give you many years of service over many happy holidays. 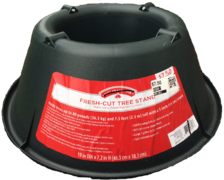 Recommended for medium to large trees.. A tree stand is required for flocked trees. We will be happy to mount your Christmas tree in your stand at no extra charge. Flocked trees will also be poly-bagged for transport at no extra charge. Plastic Christmas Tree stand for trees up to 6 feet tall. Not recommended for heavy trees or trees with large trunks. A tree stand is required for flocked trees. We will be happy to mount your Christmas tree in your stand at no extra charge. Flocked trees will also be poly-bagged for transport at no extra charge. Flocking of any tree purchased from Jubilee Zoo is available at $5 per foot. In order to flock your tree we must first mount it on a stand. You may bring your stand to us ahead of time or you may purchase a stand from us online or in our shop. Flocked trees need at least 24 hours to dry in our barn before moving. You may add delivery to your order if you do not want to come back for your flocked tree. Flocked trees will be mounted on your tree stand and bagged in a poly bag for travel. We advise simply opening the top of the poly bag, pulling it down and leaving it under your tree skirt for easier tree removal after Christmas. To purchase flocking for your tree online for pick up at Jubilee Zoo or for local delivery (additional charge) please enter the heigth in feet of your tree in the quantity box. (e.g. for a 9-foot tall tree you will select a quantity of 9 for this item). In the comments section of the order form you may request heavy (almost all outer branches and most inner branches completely white), medium (some green on outer branches and mostly green/brown inside), or light flocking (light to medium cover of flock on outer branches only). If no comment is left we will default to medium flocking. The Fraser fir branches turn slightly upward. They have good form and needle-retention. They are dark blue-green in color. They have a pleasant scent and hold ornaments well. To purchase your Fraser Fir online for pick up at Jubilee Zoo or for local delivery (additional charge) please enter the heigth in feet of your tree in the quantity box. (e.g. for a 9-foot tall Fraser Fir you will select a quantity of 9 for this item). If you want a tree taller than 10 feet, please email us for a quote. Taller trees take many years to grow and are more costly for us to purchase and have shipped. White Pine has soft, flexible needles and is bluish-green in color. Needles are 2½ - 5 in. long. White Pines have good needle retention, but have little aroma. They may be more suitable for those with allergies to trees with strong aromas. They aren't recommended for heavy ornaments. To purchase your White Pine online for pick up at Jubilee Zoo or for local delivery (additional charge) please enter the height in feet of your tree in the quantity box. (e.g. for a 9-foot tall White Pine you will select a quantity of 9 for this item). Not available in heights over 10 feet.